You know that feeling when you sit in a café with your little portable sewing machine purring on the table, next to a big cup of coffee? So long as the coffee doesn’t spill due to vibration, you’re good. That’s why I only do it in cafés with sturdy and solid tables. The guy who’s usually sitting nearby does it too, even though his laptop doesn’t really need a solid working surface! Maybe it sounds like a joke, but it isn’t. I just love being able to bring a portable sewing machine wherever I go. Creativity needs a change of scenery like a sword needs a whetstone – at least that’s how it works for me. And frankly, it’s not just for the sake of creativity that my portable sewing machine needs to go with me. Sometimes, it’s just a quintessential part of an activity – such as my sewing class. Or going to a cottage by the lake for a vacation. Or going to my cousin’s to babysit her kitten while she’s away for the day. Of course, portable sewing machines aren’t the strongest guys in the industry. 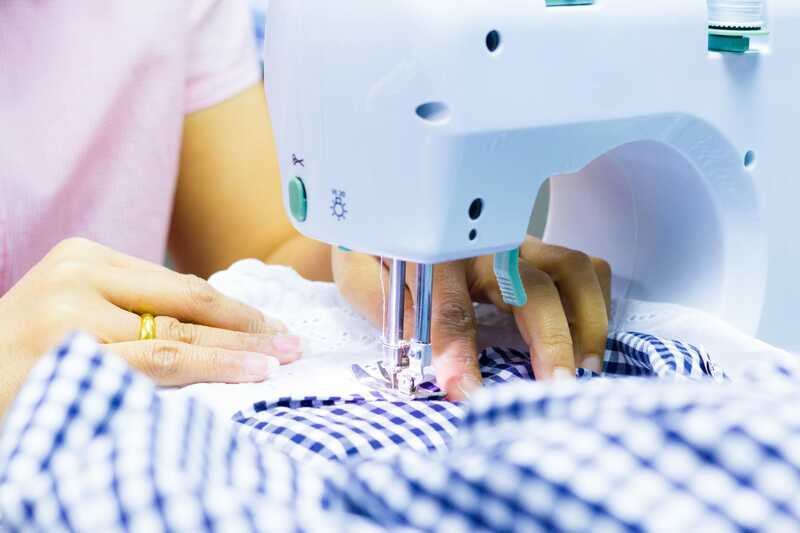 Don’t expect them to sew through every kind of fabrics – that’s what heavy-duty or industrial machines are for. 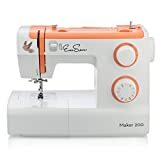 The best option for a sewing enthusiast is to have a heavy-duty machine that will be locked down at home, and a lightweight portable beauty as an alternative to bring with you. 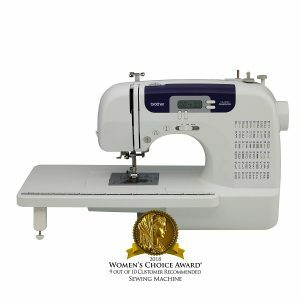 Most of the portable sewing machines aren’t even expensive, so it doesn’t mean you would have to shell out a big buck. 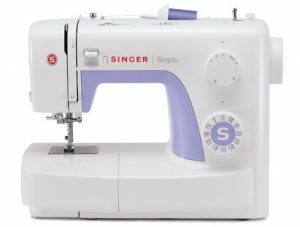 So, if you’ve decided to get a portable sewing machine, there are three basic considerations you should keep in mind. Its weight and portability shouldn’t affect performance. The fact that your new machine is lightweight and small enough to fit into a bag doesn’t mean it should be a toy. It should still have the basic features you need, while allowing you to carry and store it easily. Ease of use. If you are buying this machine to bring and use it at different places, it means you won’t always have all the tiny tools and accessories at hand. So, it’s best to opt for a functional machine, yet easy to set up and operate. Price. Since it will probably be your second machine, not wanting to splurge on it is absolutely understandable. Thankfully, there are options that cost under $100, as you will see on my list below. Behold one of Brother’s most popular models. Indeed, one of most popular portable sewing machines ever! It’s an example of best value for the money if I’ve ever seen one. 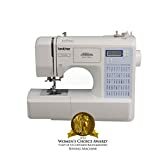 With as many as 60 built-in stitches, seven styles of one-step auto-size buttonholes and a wide array of automatic features, this computerized machine is probably the best performer within this price range. Quilters will find its wide table very gratifying. Automatic needle threader means you will never have to bug with this tedious job again, plus the programmable needle can stop in up or down positions. Adjustable sewing speed makes it very easy to control your speed when working on delicate parts of your project. Just take a look at over 6,600 amazing customer reviews on Amazon. And if this model really caught your eye, make sure to check out this comparative in-depth review I wrote in one of my previous blog posts. Even though it’s portable, it’s still a great and powerful candidate for your primary machine. The most versatile machine on my list, it will meet the needs of rookies as well as intermediate sewists. A bunch of automatic features will make sewing a breeze, with LCD screen to make things even more intuitive. Great for quilting and other large-scale projects due to the wide table, but also nice and convenient for tricky projects, thanks to the free arm option. Eight sewing and quilting feet, plus a ton of built-in stitches. Comes in a hard protective case. Could be a bit heavier for carrying than some other options, so don’t go anywhere on foot with it. This model from one of the most renown and reputable sewing machines manufacturers confirms that cheap doesn’t mean inferior in value. Its 32 built-in stitches, including 19 decorative, are more than enough for newbies and intermediate sewists alike. It would be too much to expect that your kids will be teaching their grandkids on this machine, but its heavy-duty metal frame should make sure it will last for years. Its nice automatic features include automatic needle threader and automatic reverse button for easy and convenient backstitching. If you sew through multiple layers of fabric, lift the presser foot to a higher position so you can easily manipulate the project. Four snap-on presser feet come included, as well as an accessory storage that comes off to release a free arm. Easy to set up, with a bunch of video tutorials on a DVD that comes included in the package. Very nice value, with more than enough stitches. Interior metal frame accounts for durability, sturdiness and lack of vibration while sewing. A few automatic functions such as needle threading and reverse stitching. Stitch length and width adjustment can be a little bit tricky for some users. Get a big bang for your buck with this model. Some of its features are typically found in far costlier models. While being beginner-friendly, it won’t leave seasoned sewists anything to wish for. 50 built-in stitches include clothing, decorative, heirloom and quilting options, as well as five one-step buttonholes. With 15.1 pounds of weight, it won’t be a problem to carry it wherever needed. The machine is computerized, which means you will have a bunch of automatic options and a nice LCD screen to guide you through your stitches and tell you which foot to use and when. The maximum speed of 850 stitches per minute wouldn’t embarrass even some of the semi-industrial models. If you think it might be a serious candidate for your next portable machine, check out my in-depth review of its more advanced cousin here. The number of built-in stitches is more than enough for both newbies and intermediate seamstresses. Top thread and bobbin are easy to thread. Free arm option for sewing cuffs, sleeves and other parts that are hard to access. The maximum speed of 850 stitches per minute is very satisfactory for most projects. The stitch width and length are adjustable, with LCD screen making the process very self-explanatory. The LCD screen doesn’t have a backlight and can be hard to read if you have vision issues. The machine has a lot of features, so the learning curve can be a bit steep if you are a complete beginner. A machine can’t get any lighter than this Janome! Weighing at only 5 pounds, it will literally become your best companion on any trip. It doesn’t have a lot of stitches, just four of them with 6 stitch width and length variations, including five stretch, three zig-zag stitch variations, as well as one crescent/scallop and one multi-stitch zig-zag. If you are an intermediate or advanced craftsperson, this could be your great second machine. For newbies, it would make an excellent first choice. 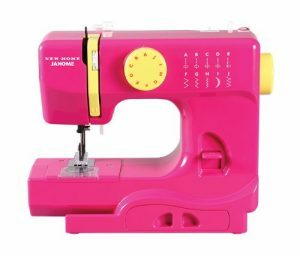 If you are one of those sewists who like to bring their machine out and about, like I am, note that the sassy bright color will turn some heads. Extremely lightweight, which makes it a great portable sewing machine. Has a finger guard presser foot, so it’s children-safe. Very beginner-friendly, without a lot of options to worry about. It doesn’t have a button to switch on and off, meaning you have to unplug it from the wall when your sewing session is done. A LED light is really needed for the working area. For those who don’t really like the bells and whistles of a computerized machine, this model could be a decent solution. With 23 stitches including a buttonhole, you can adjust thread tension, stitch length and width by using designated wheels on the top. Two knobs sitting at the front of the machine will let you control and select your stitch patterns. This machine is advertised as a heavy duty model and is robust enough thanks to the interior metal frame construction, which singles it out from competitors who heavily rely on plastics, both on the inside and outside. Another thing I like isn’t directly related to sewing itself – it’s the cute and sassy design with a touch of orange. It has some heavy duty features and will handle multiple layers of fabrics. More robust and sturdy than most models within this price range. It’s easy to wind both the bobbin and top thread. Some customers complain that they received defective machines.